Over the past four years, roughly a half-million flyers a year have been bumped from a flight on a major U.S. carrier — out of a total of about 615 million passengers flown each year. 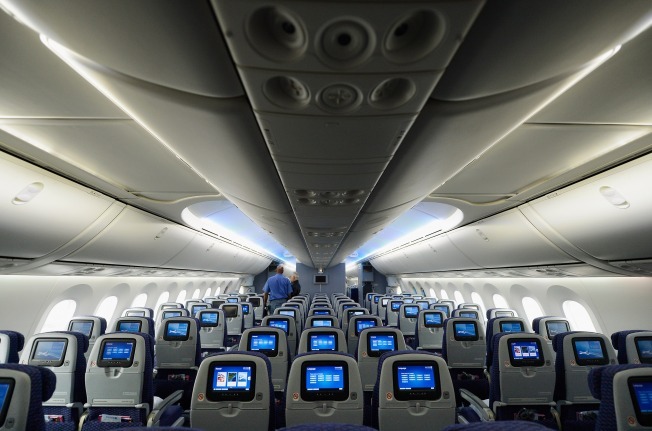 In this file photo, the economy class section on a United Airlines new aircraft the new Boeing 787 Dreamliner is shown at Los Angeles International Airport on November 30, 2012 in Los Angeles, California. Despite United Airlines' high-profile blunder in yanking a passenger from a full flight, the odds of getting bumped from your next flight on a U.S. carrier are very small, CNBC reported. But a lot depends on which airline you choose to fly. Faced with slim profit margins on each ticket sold, the airline industry routinely sells some seats twice, based on the odds that some passengers won't show up. Some airlines apparently do a much better job of calculating those odds than others, based on a review of Department of Transportation statistics on what the industry refers to as "denied boardings."